So this is the companion to my review of the movie “Hell or High Water” movie. The film brings up to the present day the Texas outlaw genre. The music is a mixture of evocative movie background instrumental and then songs from various artists that speak to the theme. The artists, Townes Van Zandt, Ray Wylie Hubbard, Waylon Jennings, Colter Wall, Scott H. Biram and Chris Stapleton are far from uniform in their styles or even genre. I believe Van Zandt is considered a folk music singer/songwriter but the songs fit the theme and even the instrumental pieces provided by Nick Cave & Warren Ellis fit together well and qualify as actual music and not just sound effects. I’ve listed the non-instrumental songs below. All in all, an enjoyable album of music. Recommended for when you’re feeling like an outlaw which for me lately is most of the time. Hell or High Water is a movie about two brothers in West Texas, Toby and Tanner (played by Chris Pine and Ben Foster), that plan and carry out a bank robbing spree. Jeff Bridges is Texas Ranger Marcus Hamilton who along with his partner Alberto are investigating this carefully planned series of robberies. The movie follows both sides of the story. We get into the heads of all four protagonists and understand their motivations and idiosyncrasies. I won’t spoil the plot details or the ending but I would say this is one of the better movies I’ve seen in a few years. It’s not a big movie and there is nothing very surprising about plot or character. But the acting is good and the plot and dialog are spot on. Another aspect of the movie that I really enjoyed was the soundtrack. Unsurprisingly it’s country music and it even includes a track by Colter Wall, a young country singer songwriter that I enjoy. But all the cuts fit into the action and enhance the movie for me. The movie gives you both points of view. The law enforcement officers, intent on stopping the crime spree and the outlaw brothers in their desperate attempt to get even with a system that they see as rigged against them. Last November I reviewed Colter Wall’s self-titled album. To say I liked it would be a gross understatement. It had such stand outs as Kate McCannon, Bald Butte and Fraulein. But the whole album was worthy. Colter has a new album and I got my copy yesterday. This is a theme album that can best be described as a country western celebration of the Great Plains. Colter is from the Canadian Plains and he concentrates on Canada but he does include a ballad to Wild Bill Hickock. I’ll list the tracks followed by a short comment or two. In addition, I’ll summarize that as a whole the album is a good traditional country western collection. And it suits me. Hopefully I’ll provide enough information for the reader to make up his mind. Straightforward acoustic guitar and harmonica western. An ode to home on the great plains. This is a short little revenge song. Very catchy and fun. This is a song by Billy Don Burns and it’s literally a song narrated by a wild dog about his life. The music has some good spots but it’s not something I care for. A western about a roundup jamboree. You could easily imagine the Sons of the Pioneers singing this song. It even has yodeling. It sounds like a spiritual mixed with a lullaby for the cows. Most of it is acapella. I like it. Western ballad chronicling Wild Bill’s life. Well done. A dirge to the changing world of the old west. Kinda downbeat. A song a bout a trucker brooding over a lost love. Amusing enough. A cokehead bemoaning his fate and thinking about his next score. Not my thing. This is an upbeat western about two drunk cowboys tying, branding and knotting the devil’s tail. There is a lot of bad music out there. And there is a lot of bad country music. One of the ways I try to find good music is by association with other good music. Case in point, a friend of mine at work told me about Colter Wall so I checked out his music and really liked it. One of his songs is a cover of the old song Fraulein. On that song is a second singer and looking him up it turned out to be Tyler Childers. So I checked out his music and really liked it. Looking over Childer’s album Purgatory I noticed it was produced by Sturgill Simpson. Now I knew of Simpson. I had his “Metamodern Sounds In Country Music” album and there was one song on that album called Panbowl that was extremely good but overall I was undecided if I was a fan. But now I decided to take another look at Sturgill’s catalog. I listened to his latest album, “A Sailor’s Guide To Earth,” and didn’t really care for it. Then I went back to his first album, “High Top Mountain,” and really liked it a lot. I’ll listen to a lot of it for the next few days and then I’ll finish up this review. But I can say already it’s a solid country album and Simpson is a good singer songwriter. The fact that I didn’t care for his later stuff as much might mean High Top Mountain is more or less all of his stuff I’ll like. That’s okay. Even finding a whole album you like is a feat worth noting. This album is definitely a win. 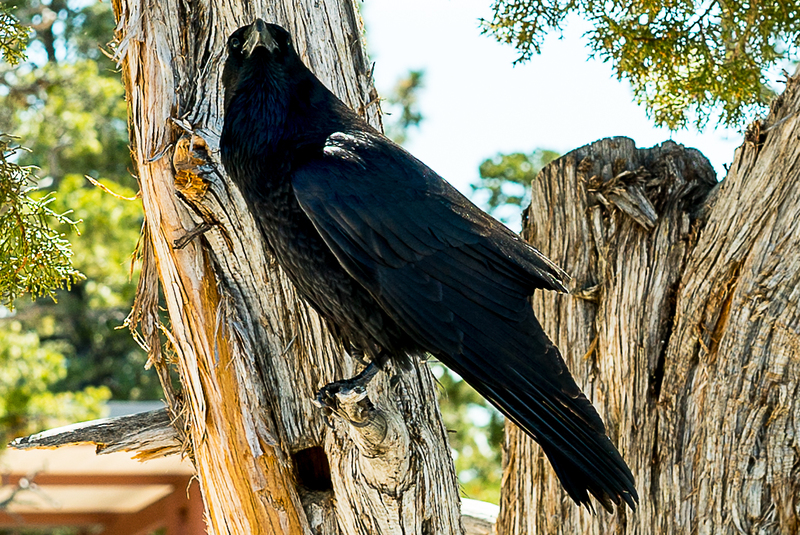 When we got to the Visitor’s Center at the South Rim of the Grand Canyon this fellow was giving me the evil eye from a low hanging perch on a nearby tree. He was croaking some kind of a challenge at me. He probably wanted me to acknowledge his suzerainty over the whole South Rim of the Grand Canyon. 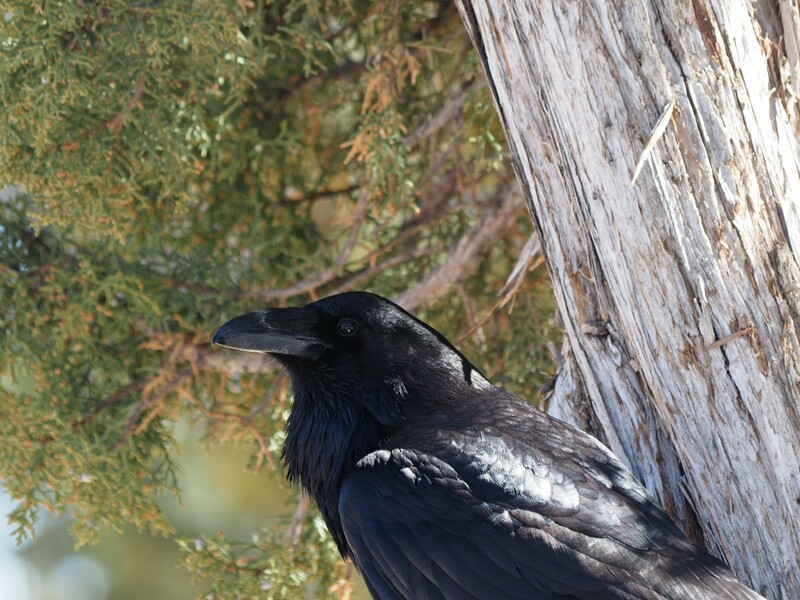 These ravens are enormous and don’t caw like crows. They croak and bellow. And anything you leave loose in your campsite is fair game. They’ll steal anything smaller than a duffel bag that’s interesting looking, especially anything shiny or edible. And just about anything is one or the other from their point of view. One sat in a tree above our campsite and serenaded us with abuse at sunset and again at sunrise. All in all, a very impressive creature. Almost thirty years ago I read a book called “Ravens in Winter” by a guy named Bernd Heinrich. He was studying ravens in Maine. He described how intelligent and social the birds were. I’ve always wanted to see them up close. Now I’m jealous of those living in the west where they are very common. I heard of Tyler Childers by seeing his name as the accompanying singer on Colter Wall’s song Fraulein. Since I liked the sound of his voice on that song, I looked him up (on Amazon.com of course!) and saw that he had a few albums. I ordered his most recent one (Purgatory) and gave it a listen. It’s really very good. There seems to be a generation of Country musicians who you don’t hear on the radio but play very original stuff that’s more closely related to traditional country music than most of the commercial country you hear on the radio. I wonder if the drug content in the songs is keeping these guys off the radio? Well, whatever it is they are producing good music. I just won’t be playing it around my grandkids. And get off my lawn!! !